oh my! Those are so cute!! I am always impressed with artists who use any pens/markers well. The cards are lovely and the coloring is perfect. I haven't used these pens, but I've heard lots of good things about them. Really cute cards! Interesting pens! I gotta go check them out! Thanks! Really cute cards! This pens looks amazing too! I would love to try them! These tea cups are so pretty colored in pastels. I like the automatic shading you get. I think this is the cutest set. I love tea so this set is a "must have" in my book. Beautiful cards! Love the sweet tea cups and the beautiful coloring! 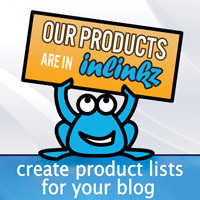 Great collaboration of fabulous products on this hop! Love how soft these colors are! Very cute cards. Love the colours. Melania and Chunyuan certainly know how to use these new pens. Colors are fantastic on these terrific cards. These are great! I love the card/tea bag set! I love the tea gift bag--so creative. I am loving the colors. I don't even know how to use Copic pens because I feel like I don't have enough artistic ability to make the right choices. So when I watched the video on one pen vs multiple pens I was both intrigued and enthralled. Very lovely tea cup card too. Sweet projects! 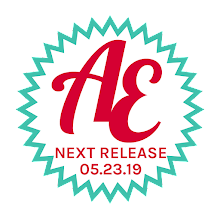 This AE set is on my wishlist. Would love to try those pens... the girls are doing a fab job with 'em! This tea time set is so adorable, and versatile too! I can't wait to get my hands on this! Definitely on my wish list! Adorable Cards. Just love the automatic shading of these new Ink makers. Make's blending a breezes. I would really ENJOY them. These are both very sweet! LOVE Melania's tea treat bags! Such a wonderful idea! TFS! Loving these creations! The colors are fantastic and the tea cups are darling! Love both cards so much! The tea set is so cute! And I love the color gradients with the same pen! Love the tea cup cards. Super cute set. I love the stamps. Awe, how cute are those little tea cups!? Oh yes, loving today's projects BIG TIME. Such a gorgeous design! Love those good coloring cups. SUPER CUTE HIGH TEA TREATS!!! 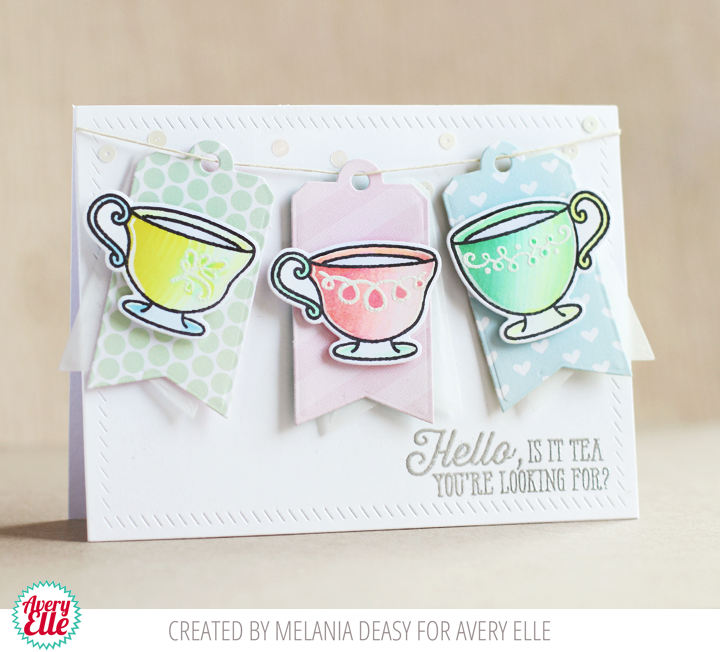 LOVE Melania's tea cup banner and tea bag gift set, the stamps & dies are SO PRETTY & FUN and - WOW - only 5 markers?!?! AMAZING!!! LOVE Chunyuan's card too, a great design & colour combo, finished off perfectly with the doily, stripes & string!!! Pretty cards, and being a Lionel Richie fan, the sentiment on Melania's card tickled me. These cards are adorable and the markers are awesome! Both tea cards are so cute. I'm loving those cups. Absolutely adorable! Love, love, love the coloring and layouts!!!! The tea cups are so cute - they are naturals mixed with a doily! Thanks, Chunyuan and Melania, for your great ideas! 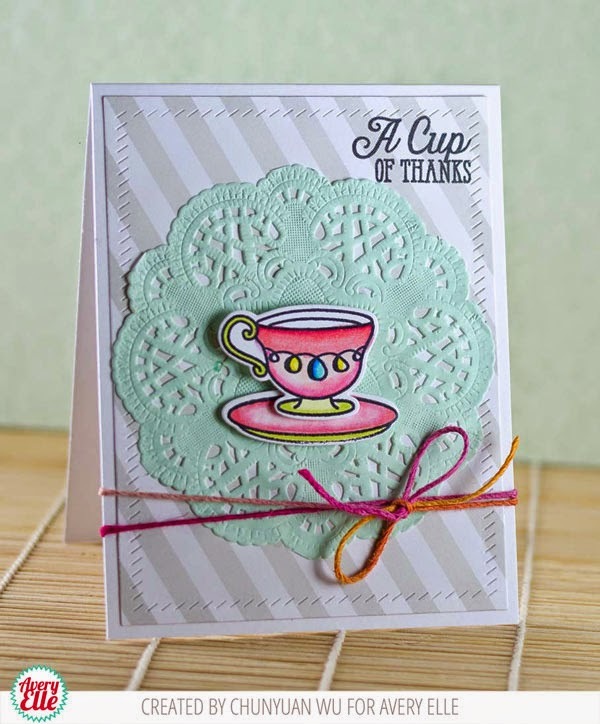 Love that tea cup stamp ~ such sweet colors! Wow, these cards are beautiful and the colors are dreamy! Great cards!!! These markers are definitely looking like a must-try!!!! 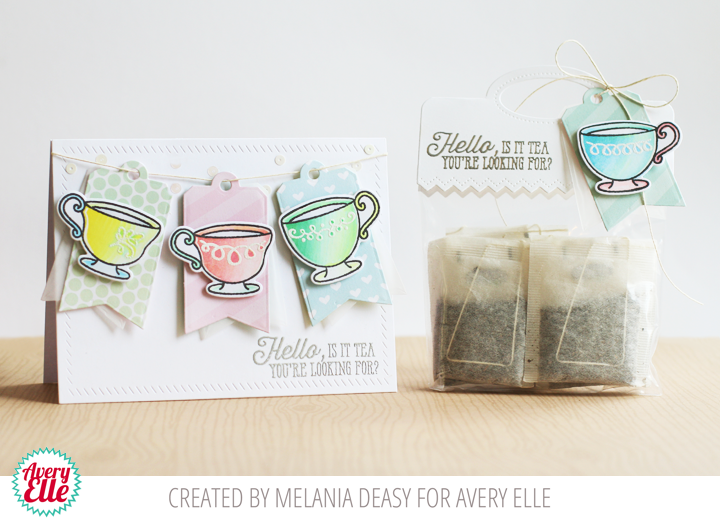 This is absolutely adorable- I love the tag with the tea bags too- great ideas, thank you for sharing! Adorable cards. I love the 1st one - so sweet! Wonderful creations. I love all the delicious sorbet colours. Fantastic! I love the tea bag holder and the doily! So FRESH! These cards are so super-cute! Love those little teacup stamps! Very cute and colorful cards. Love what I am seeing on the pens too. Nice color combinations! I love the edge detail on the base card! So very cute, love the tea! Gorgeous coloring for those little cups. Thank you! These are beautiful cads. The tea cup image is so sweet. I love how they were coloured. As yet I don't have ANY alcohol markers and the Chameleons are looking mighty interesting. I am seriously considering them! A great combo, Avery Elle & Chameleon! What cute cards...love the little tea cups...would never have thought to make a banner with them! So sweet! those tea cups are adorable! I love the soft colors, too!!! Great job! Fun projects. Would love to try these pens myself. I'm a tea drinker so I'm loving these cards. Thanks for the inspiration. The tea cups, sporting their pretty shading, are absolutely stunning! Wonderful pairing of AE and CP! Just beautiful!!!!! Love the delicate colors from the Chameleons!! Fabulous ideas! Melania's Tea bag gift set is lovely. TFS. Loving all the great ideas and samples by the DT's. Just love those feminine tea cups!